Locals are due to descend on a good old fashioned country fair held right here in the capital this Saturday. The Peninsula Parish, made up of both St Aidan’s and St George’s churches, is holding its annual gala this Saturday, October 15. Convenor Beverley Alexander said there would be something for everyone at this week’s event, which will take place at St George’s Church in Seatoun. Continued on page 2 Beverly Alexander and Tim McKenzie are inviting the community along for some good old fashioned fun at a gala this Saturday. Good old fashioned gala Continued from page 1 Beverley said “all the usual lovely activities” would be on offer at this weekend’s fair. There would be face painting, cupcake decorating, hook a duck and a toy stall on offer for the children and rapid raffles, a plant stall and white elephant available for the adults. Once again this year there would also be Ethiopian food on offer along with a barbecue boasting the usual sausages and meat patties. This year, the Kilbirnie Fire Station would be on hand to give children the opportunity to take a close look at a fire engine. “The station officer from Kilbirnie is bringing his crew and the fire appliance. They will also carry out a fire safety presentation,” Beverley said. “The kids just love it.” Vicar Tim McKenzie said they tried to keep activities nice and affordable for the community. “It’s not about money it’s about showing everyone a good time,” he said. “It is kind of like a little window into another way of being – it’s like Downton Abbey. We are not trying to make top dollar, we are trying to show the community a little fun.” He said with the annual Seatoun Arts and Crafts Exhibition also taking place over the weekend, it was a great opportunity to visit the seaside suburb. Beverley said the annual gala was used as a fundraiser for the parish. “The funds are for the parish and the community. We are always on the lookout for people who need a little bit of help with this, that or the next thing.” They will also use money raised to continue to support refugee families who move to the area. 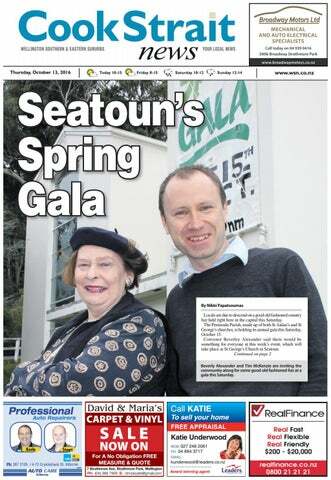  The Peninsula Parish’s spring gala celebration will take place this Saturday, October 15 at St George’s Church, Ferry St, Seatoun, from 11am to 2pm. and the ministry to better manage behavioural matters whilst keeping students and staff safe. In a statement, head of special education for the Ministry of Education, David Wales, said the ministry first became aware of the situation on July 25 after a parent made contact, and the principal was immediately contacted. He said while there were still a number of schools around the country that did use these rooms, the ministry strongly recommended schools discontinued use of such rooms, in line with the soon to be released guidelines for New Zealand schools on the minimisation of physical restraint. SMALL BUSINESS SPECIALISTS With a range of great accounting services SBA is the first choice for small businessess. Each workshop will be held twice, so you only need to attend one of each session. Workshops will be held at Island Bay Baptist Church, 284 The Parade. Free onsite childcare is available at all workshops. Justin Lester has been named Mayor of Wellington following a hotly contested mayoral race. Mr Lester, who has spent six years on council, most recently as deputy mayor, was named the capital’s new mayor last Saturday, replacing outgoing mayor Celia Wade-Brown. Mr Lester took out the mayoralty by a clear 6000-vote margin over former Porirua Mayor Nick Leggett, with former Wellington City Councillor Jo Coughlan coming in third place. He also beat fellow candidates Nicola Young, Andy Foster, Helene Ritchie, Keith Johnson and Johnny Overton. Mr Lester, who was sitting in the barber’s chair when he got the news, said he now intended to hit the ground running. He said he had already met with newly elected councillors over the last few days and would now work on creating strong ties with central government. Unsuccessful mayoral candidates Ms Coughlan and longstanding northern ward councillor Ms Ritchie would leave gaps on the council after deciding to go all-in on the mayoralty. “The spaces will provide big opportunities for new councillors to fill those gaps,” Mr Lester said. “My first priority will be to divvy up portfolios – councillors have already started talking about what their priorities are and it’s great to see them working away already.” Another priority was to build a strong council that worked well together, Mr Lester said. Mr Lester, who announced he would make a bid at the top spot last December, said he was “over the moon” to be elected mayor. While he said he was “cautiously confident” after running a seamless campaign, he knew every vote in this year’s elections – right up until midday on Saturday – counted. Mr Lester was thankful for the support of his family, friends, volunteers and voters. “I want to thank Wellingtonians for their support. I’m truly honoured and I feel really privileged,” he said. “I’m looking forward to doing a good job.” Meanwhile, it will come as little surprise that Mr Lester has named southern ward councillor Paul Eagle as his deputy mayor, after the pair spent the last 10 months campaigning together. Wellington Friday, 21 October at 12.00 p.m. Frank Kitts Park, next to the TSB Arena 30 minute walk along the waterfront to Te Papa and back For information ring us on 04 801 7808 * Walks will proceed rain or shine. Mr Eagle said he was humbled and honoured to be named as Mr Lester’s deputy. “We came in together in 2010, who would have thought six years later we would be holding the two top positions for the capital city. Mr Eagle said his main focus would be supporting Justin and he would help to unify councillors to “build a strong team to get things done in Wellington,”. Local body election results 2016 WELLINGTON CITY COUNCILLORS: Southern ward: Paul Eagle and David Lee. Eastern ward: Sarah Free, Simon Marsh and Chris Calvi-Freeman. Northern ward: Malcolm Sparrow, Jill Day and Peter Gilberd. Onslow-Western ward: Andy Foster, Simon Woolf and Diane Calvert. Lambton ward: Iona Pannett, Nicola Young and Brian Dawson. Sue Kedgley, Chris Laidlaw, Ian McKinnon, Daran Ponter and Roger Blakeley. A competitive hourly rate will be offered. Fran Wilde, Sue Kedgley, Eileen Brown, ‘Ana Coffey, Kathryn Adams, Roger Blakeley and Sue Driver. A Hataitai resident is one of the new faces to be elected to the council table following this year’s local body elections. Chris Calvi-Freeman will join returning councillors Sarah Free and Simon Marsh in the eastern ward, taking a seat made available after previous eastern ward councillor Ray Ahipene-Mercer announced he would be stepping down. Chris said he was pulling down a frame that supported one of his campaign hoardings when he got the call notifying him he had been elected. “It felt good, I had felt quietly confident that I would secure that third seat from asking around, but it was a huge relief.” Chris, who has worked as a transport planner both in New Zealand and overseas, was raised in Wellington and previously chaired the Hataitai Residents’ Association. He said his plan was to hit the ground running, and the last few days had been spent meeting with the mayor and other councillors. Chris Calvi-Freeman is the new eastern ward councillor. Book now and get your ﬁrst class free! Check us out at www.meetup.com under 'Shelly Bay Fitness Dance' Or ‘Shelly Bay, Fitness, Fun and Body Changing” Late bookings welcome. Isla Bremer, 9, plays with a rabbit at Animates Kilbirnie. the children to cuddle. Animates store manager Chris Mitchell said he went through cat and dog activities, feeding and other skills you need to be a responsible cat or dog owner. “Hopefully we can help them realise there is a little more to [being a pet owner] than having a fluffy companion.” The Kilbirnie Animates store, located on Mahora St, opened in August and created 10 new jobs locally. Meanwhile, southern and eastern suburbs’ residents are encouraged to visit their local Bunnings during Get Ready Week for practical information and activities on how to get prepared. Childrens’ workshops will be run in store this Saturday and Sunday, where kids will have the opportunity to make a take-home emergency board that includes vital information to ‘grab and go’ in the case of an emergency.  For more information head to www.whatstheplanstan.govt.nz  Kids’ workshops will take place at Bunnings Lyall Bay on Saturday, October 15 and Sunday, October 16 from 12.30pm. Two of the founders of Big Think, George Lill and Jeremy O’Connor. 30% o ff with co "betteur pon study"
Visit us online at taying Staying www.wsn.co.nz afe is is safe more more han just than just taying staying flafl oat. oat. you Have seen Maritime latestNZ’s lifejacket ‘80’s TV cop you seen NZ’s Maritime latest adverts lifejacketfeaturing adverts featuring ‘80’sJoe TVBro? cop Joe Bro? Safer Boating Week ries the very important message that lifejackets will not save lives unless they It carries the very important message that lifejackets will not save lives unless they 14–21 October eing are worn. Most accidents occur suddenly with no warning there may be no being worn. Most accidents occur suddenly with no –warning – there may be no to grab a to lifejacket, and it’s extremely difficult todiffi putcult on to aout lifejacket in the water. Check time grab a lifejacket, and it’s extremely put on a lifejacket in the water. y boaties less than less 200 than metres shore. Manydrown boaties drown 200from metres from shore. carry lifejackets on all vessels and wear them on vessels under 6 meter, obey the 5 knot rule and always travel at a safe speed. In Wellington we have rapidly changing weather. more information you can look at www.gw.govt.nz/harbours or email harbours@gw.govt.nz mail harbours@gw.govt.nz Forof reports unsafe behaviour or eports unsafe behaviour or or breaches For reports ofof unsafe behaviour of breaches of Navigation Bylaws call 04 388 7795. chesNavigation of Navigation Bylaws 04 388 7795. Bylaws call 04 call 388 1911.
work as it is intended to. For more information you can look at www.gw.govt.nz/harbours or email harbours@gw.govt.nz For reports of unsafe behaviour or Enjoy your breaches of Navigation Bylaws call 04 388 7795. Eastern ward councillor Simon Marsh says no concrete plans have been made as to what the council will do with city owned land at Shelly Bay. Dr Libby is visiting Wellington as part of her Australasian tour. St Mark’s Preschool St Mark’s Preschool is situated on the grounds of St Mark’s Church School. Licensed for 50 children aged 2 to 5, our Preschool is a warm and caring environment where children set out on the first part of their learning journey. each day, children at St Mark’s Preschool enjoy Music, Spanish and PE each week. As children become ready, our literacy and numeracy programme helps build their skills and ensures their readiness for the transition to school. Some 27 Wellington community arts projects have received a total of $65,155 in grants from the latest round of the Creative Communities Funding Scheme administered jointly by Wellington City Council and Creative New Zealand. Every year Creative New Zealand provides money to councils to support local arts activities as part of the scheme. Paul Eagle and his son Tama on the Island Bay cycleway. readers have their say... Find out the WORD on the Street. Q: Do you think more people would vote in the local body elections if online voting was available? Island Bay Baptist Church members enjoy their monthly pre-service morning tea at Kilmarnock Heights Home. de Ruyter cherishes the regular visits from members of the Island Bay Baptist Church. “My church has a service here once a month and they come in beforehand for morning tea. It’s a day I really look forward to - I enjoy them coming in and they’ve been doing it for many years,” says Co. Island Bay Baptist Church member Margaret Crisp says their visits not only make the church services more accessible for the people of Kilmarnock Heights Home, it also upholds the residents’ contact with their local community. “The social aspect of having people from outside the home visit is really important,” Margaret explains. “Research shows that being social and connected is good for a person’s wellbeing, and Co used to go to church with these people so it’s one day a month where they get together again and have a catch up.” Kilmarnock Heights Home is operated by Enliven, part of the not-for-profit organisation Presbyterian Support Central, and provides rest home and respite care as well as a popular day guest programme.  For more information about Kilmarnock Heights Home, located at 20 Morton Street in Berhampore, or to become a regular visitor to the home, call 04 380 2034 or visit www.enlivencentral.org.nz. Thank you for your support/vote. St Catherine’s College At St Catherine’s College we understand that parents want the very best for their daughters and an exceptional education is the best gift of all. Our college continues to strive to be the very best with our inclusive values and practices that promote student wellbeing for success. St Catherine’s has high standards of achievement at all levels, with NCEA pass rates being amongst the highest in the Wellington region. she laughed. After accepting the keys to their new car from owner operators at Newtown New World Donald and Susan Chung, Win and Maria said they were excited to get their brand new car on the road for a test drive. As part of the promotion, 138 New World stores across New Zealand each gave away a Holden Spark with a price tag of $17,990 – coming to a total of more than $2 million dollars’ worth of cars. Customers received one entry into the draw with every $50 they spent in store and swiped their Fly Buys or Airpoints card. During the three week campaign, there were more than 2.1 million entries into the prize draw. Our new building is now completed and we look forward to the Naming and Blessing ceremony to be held on Friday 14 October 2016. With the expansion of our school, we now have a few spaces available at some levels. they may not be suitable for your health condition. Other people's medicines may interact with other medicines you are taking. Store medicines correctly and dispose of them safely. Safe means out of reach of children - preferably in a locked cupboard. This is really vital when children come to your home only occasionally. Store medicines in a dry place, away from direct light or heat, so they don't degrade. However, some medicines need to be kept in the fridge. Don't keep medicines that are no longer needed. Despite the wastage, there are safety concerns in keeping old medicines "just in case". Don't throw them out in general rubbish, instead, talk to your pharmacist about safe disposal. Medicines returned to your pharmacist cannot be reused, and charges cannot be refunded. Discuss with your pharmacist if your medicines look different from what you are expecting. It is best to be reassured that everything is as it should be. If you are having trouble managing your medicines, your pharmacist may be able to help with their packaging especially for your own individual medication needs. Talk to your Self Care pharmacist about your medicine, to get the best outcome for your health. Centre. “It’s a chance for us to connect with a whole new group of people,” Holocaust Centre of New Zealand national director of education Richard Browne said. “I hope it will provide a greater connection with seniors.” The Holocaust Centre has been running for nine years and has a range of relics on display from the Holocaust, including artwork done by children in concentration camps. “It’s all authentic and real,” Richard said. The exhibition will run for a final time today as part of Seniors Week from 11am at the Holocaust Centre, 80 Webb St, Mt Cook. Anyone is welcome, however, priority will be given to seniors. Weeding, Pruning, Hedge Trimming, Planting & Wainui Self Storage, Waiu St, 0274805150. Design, Section Clearing. Phone 0276629724. With guest speaker Matt Dagger from Kaibosh, on the topic of food waste & food rescue. Thursday OF THE D AY13 October, 6.30-7.30pm, 27 Chelsea St, Miramar. 51. J.K. Rowling Property Wanted chose the unusual name ‘Hermione’ so young girls wouldn’t be teased for being nerdy! CRAFTSMAN PAINTING TEAM PLUMBER Public Notice Exc. Refs. Comp. Caring for your garden: • General maintenance • Weed- SPRING GALA Sat 15th October, 11am-2pm, St ing • Pruning • Planting • One-Off jobs • Regular care George’s Church, Ferry St, Seatoun, Enjoy cakes, • Experienced Gardeners. Phone Julie on 0273324896. plants, books, Christmas goodies, Children’s activities, toys, Music, Fire Engine, Rapid Rafﬂes. rates. Free quotes. Phone 04 977-7850 or 027-451-5005. All advertisements areFormerly subject to the approval of Wellington Suburban cpa spares Newspapers. Advertisements are positioned entirely at the option of The Publisher & no guarantee of placement is given. Applicable loadings apply only to the specifi c placementDirector of strip or island advertisements. Funeral Placement & approval is at the discretion of The Publisher. While every effort will be made to publish as instructed, The Publisher accepts no liability for any loss caused through loss or misplacement. The Publisher reserves the right to reject any advertisement considered unsuitable for publication. Advertisements will be charged on the size of the material supplied or the space ordered whichever is the greater. It is the responsibility of the Advertiser or Advertising Agent to notify Wellington Suburban Newspapers of any error within 24 hours of its publication. The Publisher is not responsible for recurring errors. To obtain a classified space order (defined as annual commitment of advertising space or spend) please speak to your advertising representative. (Surcharges may apply if commitment levels are not met or cancellation of a space booking & or contract). Cancellation: neither display nor classified cancellations will be accepted after the booking deadline. No credits will be issued to classified package buys that have commenced their series. If an advertiser at any time fails to supply copy within the deadline, it is understood & agreed that the last copy supplied will be repeated. Specific terms & conditions apply to certain classifications. These may relate to either requirements & conditions set by industry standards for the advertising of certain goods & services, or set by The Publisher. Please speak to your advertising representative to obtain a full copy of these. Advertisers agree that all advertisements published by Wellington Suburban Newspapers may also appear on a relevant website. Interior installations by top-qualifi ed electrician with Painting & Advertise your record of over fi fty years of giving locals the Wallpapering services here. GARDENING SERVICES, GARDEN SENSE SECURE STORAGE 14sqm $42 per week. All Garden Maintenance: Lawns, WELLINGTON. FROM LEFT: Amalamo Simi, Oscar Robinson and Wiko Du Toit with David Grain (Coach). a place on the New Zealand team, a group of 12 students set to compete against the United Kingdom team at a later date. The boys travelled to the competition with a team from Samuel Marsden College, all of whom made it into the North Island team, with one carrying on into the New Zealand team. “The support the kids gave to each other over the weekend was fantastic,” Craig said. The smallbore rifle shooting season came to a close last night with a competition between Wellington’s clubs at the Royal Tiger Range in Newtown. Wiko took part as Brooklyn’s champion D Grade shooter. Cycle-friendly Strathmore locals can give their bikes a tune-up at a special event this weekend. A free Bike FixUp event will take place at Kahurangi School on Strathmore Ave, this Saturday, October 15. The fix-up is organised by Wellington City Council in partnership with The Mechanical Tempest and Pedal Ready. This Saturday, Mechanical Tempest will be on hand to help locals learn how to maintain and fix their bikes. As well as this, Rebicycle will be on hand to help people re-home second-hand bikes they no longer use. For the children there will be fun bike activities with prizes available, and there will be electric bikes for people to try out. Pedal Ready will also share some tips and tricks to being a better rider. Council spokeswoman Kim Young said council hoped the free event would support and encourage people to ride bikes as a smart transport option, or for leisure. “This is the first community based fix-up and builds on the success of the fix-up held at Victoria University and others on Oriental Parade and Basin Reserve,” she said.  The free Bike FixUp event will take place this Saturday, October 15 at Kahurangi School in Strathmore Park from midday to 2pm. There will also be free coffee available. stand the class of players like Christian Cullen, Jeff Wilson and Ian Jones. A fresh-faced Andrew Mehrtens became my favourite childhood player and there were defining memories created that are forever etched in my mind. Zinzan Brooke’s drop goal in the deciding test, captain Sean Fitzpatrick dropping to his knees and punching the ground in pure exhaustion after hearing the final whistle. There was something utterly compelling about it. The non-playing reserves, including an injured and ill Jonah Lomu, giving the team a Haka from the grandstands in their white dress shirts and black ties. The quality of some of the Springbok players wasn’t lost on me either. Halfback Joost van der Westhuizen and lock Mark Andrews I still consider two of the best players of their time. Children of this generation can have their Richie McCaw’s and Dan Carter’s but for me, names like Fitzpatrick, Frank Bunce, Walter Little, Simon Culhane and Glen Osbourne were names that may not be household All Black names of the past but they helped me find my first passion in life - the All Blacks. Presented by Dean Blair Authorised Financial Adviser - Wellingtonian “I am passionate about changing the face of Financial Literacy in New Zealand. I champion this change by running Financial Literacy workshops for families, young professional groups, corporates, colleges, universities and professional athletes in Wellington, Auckland & Christchurch. Come along to the Brooklyn Lions & FoxPlan workshop “Financial Planning 101” so you can gain skills on becoming financially fit, get a better understanding of financial jargon and bust the myths around the meaning of money.